For a (death) metal show, decibel levels started out, and stayed, surprisingly low, but it made for a balanced mix, especially near the stage. Denmark's Mnemic took to that stage first, immediately kicking the night into high gear. The crowd response Mnemic drew was uneven - their industrial metal sound, inherited from the likes of Fear Factory, made them the oddballs of the line-up - but they delivered a solid set and kinetic performance. Hypocrisy quickly followed, now opening for a band they had headlined over just two years ago. Although their set list left many gaps, it did blend in several old tracks with the new, and Hypocrisy's performance was right on target. Dark Tranquillity may have been the happiest-looking metal band of the night, totally riling up the audience with their Toronto debut and slaughtering (in the best way) songs off their new album, Character, as well as earlier material. The crowd's enthusiastic appreciation for Hypocrisy and Dark Tranquillity made the two Swedish classics tough acts to follow and Soilwork faced the disadvantage of having alienated many extreme fans with the accessibility of their recent releases. Still, they obviously had numerous supporters in attendance, and the band's material translated well to a headlining gig. 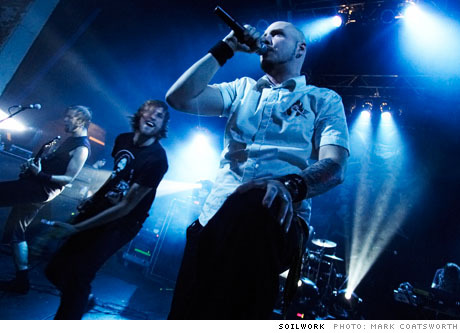 Tighter and with better sound than their previous Toronto appearances, Soilwork offered a well-coordinated and highly electrified delivery of both vintage and fresh songs. It may not have been the concert of the year, and short sets from Hypocrisy and Dark Tranquillity were inevitably disappointing, but the one-night Scandinavian takeover of Toronto was an easy victory.